Walk up Main Street, walk down to MASS MoCA, and ascend to the summit of Mount Greylock, and don't miss the archeological collection in the Public Library. The summit of Mount Greylock, the highest mountain in Massachusetts, is a 9-mile (14.5-km), 25- to 30-minute drive up a narrow mountain road (closed in winter). If the air is clear and dry, you'll enjoy spectacular 72-mile (116-km) views. A variety of hiking trails lead to the Bascom Lodge at the summit. 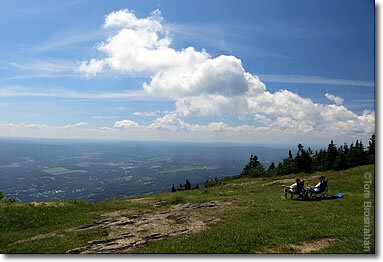 Enjoying the view from the summit of Mount Greylock. With the completion of the 4.75-mile-long (7.64 km) Hoosac Tunnel through the Hoosac Mountains (the second-longest railroad tunnel in the world at the time), North Adams was connected directly to the shipping docks at Boston. Already rich in water powered factories, North Adams became Massachusetts' Western Gateway, bringing goods and travelers to and from New York state. 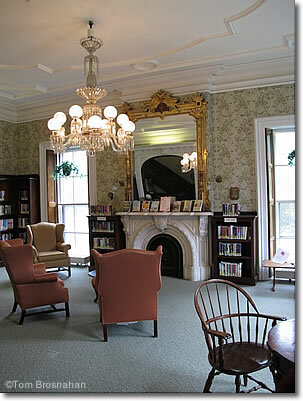 Many New England towns are fortunate enough to possess—and preserve—grand 19th-century public libraries built by thoughtful citizens and patrons to be intellectual and educational centers of their communities. A prosperous 19th-century North Adams citizen built and endowed the fine North Adams Public Library, and today's citizens have preserved this fine public treasure. 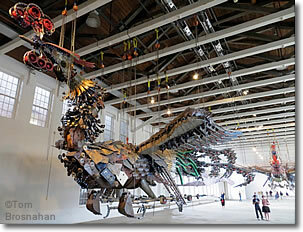 the huge space of Mass MoCA, North Adams MA.